Shrink's Veiws by Dheeraj Kattula is licensed under a Creative Commons Attribution-Non-Commercial-Share Alike 2.5 India License. Cityscapes are frightening topics to paint. There are too many subjects in the field of vision. I learnt a principle in recent times that every painting should have a focus and that detail is not important everywhere. I also learnt from blog of Frank Eber that little is much if we could succeed in giving an impression of the subjects. 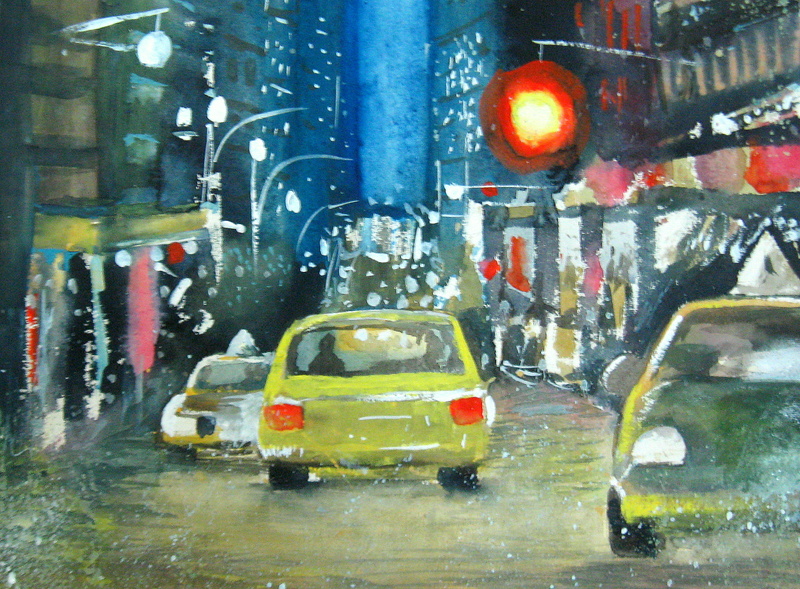 This painting has elements of keeping things loose in the background only giving impression of a busy road. I used acrylic white for highlights. This helped giving an opaque white effect. random strokes and dots of white gave the impression of busyness of a street. This entry was posted on January 7, 2012 at 5:23 pm	and is filed under art. You can follow any responses to this entry through the RSS 2.0 feed. You can leave a response, or trackback from your own site. i didnt know that you are such a good artist! May the lord bless you ..and keep going ! Thank you for your comment.I hope to paint more once MD final exams are over in April 2013. Wish you and your family a happy and blessed New year. Hi there! I understand this is sort of off-topic however I needed to ask. do write in my journal daily. I’d like to start a blog so I can easily share my experience and views online.